COLONIAL AMERICA. New Jersey. St. Patrick farthing in silver. 7.63 gm. 25 mm. 117.7 grains. (Also catalogued as Irish coinage in the Spink Standard Catalog of Scotland, Ireland et al). Circa 1670. King David kneeling left, playing a harp, a crown above; FLOREAT : REX / St. Peter standing, holding a metropolitan cross in his left hand and with his outstretched right hand driving out the reptiles, a church behind and to the right; QVIESCAT PLEBS (no punctuation); edge engrailed vertically. Breen 210. W. 11520. Spink SC 6570. D&F 344. Nelson obv. and rev. first dies. Substantial detail, Very Good to Fine; simply well worn, not notably damaged, and with a fair amount of detail remaining; extremely rare; the reverse has faint indication that the piece was struck over another coin issue. The Newman sale by Heritage, January 3, 2008, sold Newman's example for $3360. The dies on that piece are the same as on this piece. The Newman piece was lighter at 99.5 grains and the NGC slab noted "Mount Removed" and assigned a grade of "Fine Details." Breen notes weight fluctuations on this type ranging between 77.8 to 123 grains. Red Book note: "Mark Newby…brought copper pieces believed…to have been struck in Dublin circa 1663 to 1672.…The coinage was made legal by the General Assembly of New Jersey in May 1682." 343 lots are now closed. LUCANIA. Sybaris. Before 510 B.C. AR nomos. 8.41 gm. 30 mm. A bull standing left, head looking back; dotted ground line; V M in exergue / Same design, incuse and inverted. 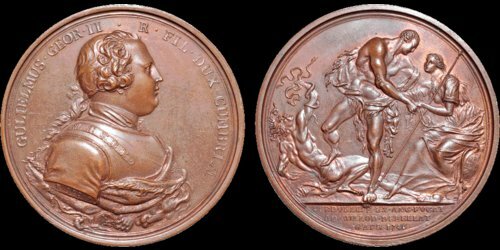 HN Italy 1729. SNG ANS 841. Extremely Fine; fresh; full weight; broad flan with edge details. Excellent metal for issue. Handsome coin, good style, with lightly iridescent cabinet toning, highlighting the artistic merits of this dramatic issue. This is a beautiful example of an important type. Sybaris, founded by Greeks around 720 BC on the instep of the Italian boot, amassed vast wealth from its busy port and rich agricultural lands, and is frequently identified in ancient literature with ostentatious luxury (hence our word “sybarite,” a self-indulgent lover of luxury). The cities of Greek southern Italy in the sixth and early fifth centuries BC developed the relief/incuse pattern used to make this remarkable coin. The process required precise flan preparation and die alignment. 203 lots are now closed. James I. 1603-1625. AR shilling. 5.82 gm. 29 mm. 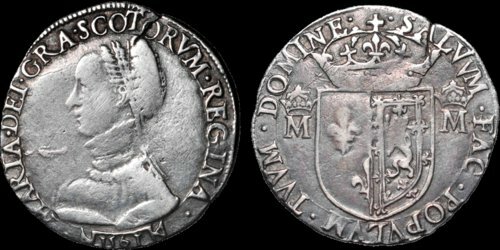 Second coinage, 1604-1619. Fourth bust. Escallop i.m. His bearded fourth bust right, XII behind; IACOBVS D G MAG BRIT FRA ET HIB REX / Square-topped shield; QVÆ DEVS CONIVNXIT NEMO SEPARET around. S. 2655. N. 2100. Good Very Fine; well struck on a full round flan; multihued old toning over fresh surfaces. E-Auction 29 Aftersale Lots Available Now! You will find variety in our spring sale. Opening bids from $16 to $5000. Gold coinage, interesting and affordable classics, including early Greek electrum, an early Islamic trade coin, an affordable Nero aureus, a pretty Byzantine scyphate, a choice Celtic Britain stater, and more modern British issues, including a pretty milled George III quarter guinea and a 1989 commemorative sovereign (an important modern British rarity). Continuing, from here in North America–a rare New Orleans mint quarter eagle, California gold, and finally, from the world of myth, a Hobbit fantasy gold piece. 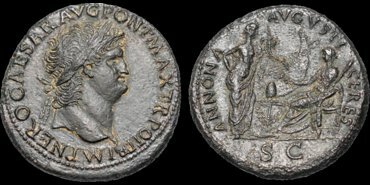 Greek and Roman coins—look for the marvelous Sybaris stater with its remarkable incuse-reverse stater (lot 19) (made by creative and careful minters—this was not an easy coin to produce correctly); fascinating countermarks (lot 26), a rare Roman bronze brockage with an appealing portrait of Claudius (lot 52).